Well, I have a friend, a vet tech working at the vet clinic and she saw some of my paintings and asked if I could paint a gift for her boyfriend, a painting of their cutting horse. My first "commission"! She sent me some great photos, and I thought about colors and paper and size of the painting, and even about lost edges (everything I have learned from reading my artist friends' blogs!). Then I did what every good artist should do, I put aside her photos and my trusty watercolors and found a small canvas and the re-gifted acrylics and messed around with those instead of working on her painting! I work so well under pressure. So, as an aside, one cold Ohio day, as my daughter rode her horse inside the indoor arena, I snuck outside and took some great photos of the horses turned out in the snow. This one grey horse mostly wanted to go back inside and when he decided I wasn't going to be bringing him in, he gave me the cold shoulder. 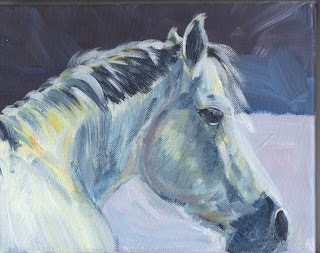 I must confess, I know nothing about acrylics, except what I have read on your blogs, so I blocked in color and shapes, and went back to model those blocks of color into something that resembled the horse in the snow. Like most of my paintings, I got to a point where I decided I have no idea what I am doing, I should have skipped vet school and gone to art school. Then when I have reached that point, I kind of give in and keep painting...and slowly I started to see a horse emerge from the mess of colors! What fun! Well, I did go back and start on the drawing of that cutting horse, and decided to treat it as a study (learned that from your blogs too, thanks Gretchen) and just have fun with it, I can always start again, if need be. As I sit here with a whole new year ahead I am wondering if I can learn to be an artist from all your wonderful blogs, I have learned so much from you already! Maria, where in Pickerington do you ride? I'm about 20 minutes from the Pickerington/Reynoldsburg exit off I-70. I love this Maria! You sure don't look like you never mess with acrylics! It is so beautiful.. I am so excited for you on your first commission.. I am finally starting to get them too. Good luck in 2011! It's going to be a great year. Thanks everyone, it is fun to try different mediums, kind of takes the pressure off, I did start the cutting horse "study" today, and started a small drawing of a kitten for a small painting. Jennifer, I like the sounds of a good year in 2011, I am ready for it! Crystal, I am honored to be included in the artist category, I am sitting a little taller right now! I love your horse, and that is how we all started with acrylics- just got them out and started! Congratulations on your first commission! You sound like my kind of artist, we could both use a little more confidence- maybe this commission will help that! Congratulations on your first commission....it is a beautiful painting! I love the glow of the yellow and pink. You did a great job if this is your first time with acrylics. I feel the same way when I use acrylics, but it is a fun change of pace and so forgiving. Leslie and Sheryl thank you for your kind comments, I will definitely play with the acrylics some more, they are so different from the watercolors, and I love being able to paint over any weak spots. You did a fantastic job on this horse! I loved hearing about how he gave you the cold shoulder when he couldn't go back in . . . so funny! You really captured that irritated look on his face! Congrats on the commission! Theresa, he had definitely decided that I was of little use to him at that point! One of your best horse paintings! Excellent.